NEW YORK-Teachers, students and others are horrified at the prospect of hundreds of millions of dollars worth of mid-year budget cuts to public education as the state faces a $3 billion budget shortfall-and they’re fighting back. The Alliance for Quality Education, a coalition of more than 230 organizations of parents, children’s advocates, schools, teachers and others, is organizing people to contact their representatives as well as to attend hearings sponsored by the legislature. Under Governor David Paterson’s (D) plans, public schools across the state would be hit with a whopping $686 million mid-year cut. At an October 23 meeting in Syracuse, AQE members broke pencils during the meeting to symbolize “the state’s broken promise” to public schools. Because so many people showed up to speak against the cut, the meeting went on for nearly six hours. Revenues have been lower than expected, leaving the state with a $3 billion budget shortfall. Paterson has called a special meeting of the State Senate and Assembly to discuss his plans, which include $1.3 billion in cuts to local governments, health and education. The rest is to be made up, mainly, of extraordinary borrowing from the state’s rainy day fund. In higher education, Paterson proposes slashing $53 million in funding to the City University of New York alone. These cuts, as well as proposed cuts to health care, public schools and municipalities, all require legislative approval. However, millions of dollars have already been cut at state agencies, where the Governor doesn’t need to seek legislative approval. He has already ordered an eleven percent cut, amounting to $90 million, to the State University of New York. Mid-year cuts are considered to be the most devastating, because institutions have already made their budget based on projected funding. Across New York City, protests have erupted at various CUNY campuses, and have included students, professors, city school teachers, labor unionists and others. Organizers of the various campaigns include the United Federation of Teachers and its parent organization, the New York State United Teachers; United University Professionals and the Professional Staff Congress, which represent professors at SUNY and CUNY respectively; the New York Public Interest Research Group; student organizations other labor unions and community residents. At Hunter College, an October 28 demonstration brought out hundreds of people. “Now is the time we should be supporting schools, now is the time to be building schools,” NYSUT Executive Vice President Alan Lubin told the crowd. Education advocates point out that the proposed cuts are on the heels of tens of millions of dollars in cuts to education in the past year, as well as a tuition hike. They are demanding that there be no cuts to education going forward, and that the legislature roll back Paterson’s cuts to SUNY. “Students are already being squeezed into overcrowded classes, missing out on courses we need, and paying more for school,” said Chris McCall, NYPIRG’s higher education project leader. Similar actions are being proposed to fight the proposed health care and municipal cuts. Others have suggested that there should be no cuts at all. Suggested ways of increased savings include cuts in spending that benefit only the wealthy and big corporations, such as: the ending of subsidies for “industrial development zones,” (saving the state $4 billion), reducing the number of governmental units down from the current 10,000 , the ending of subsidies and tax breaks to developers of housing for those above the median income ($3 billion) and other such measures. Proposals for increased revenues include a one percent surtax on people making over $1 billion yearly (there are 60 such people in New York City alone, meaning a possible billion dollars in revenue), a one percent stock transfer surtax on those with net assets above $500,000 (another billion dollars) and other proposals. 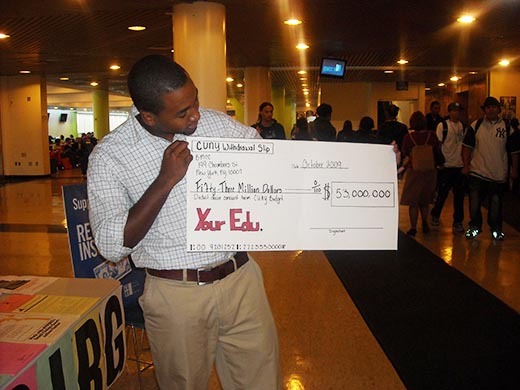 PHOTO: A student at the Borough of Manhattan Community College, where NYPIRG kicked off its campaign against budget cuts, holds a “CUNY withdrawal slip” for $53 billion.